I thought it would be helpful if we have a pinned thread here in EKT listing all the latest audio apps that either become available, feature price drops, or are especially useful so fellow music makers here can be aware and take advantage of new tech and great deals. In each listing, please include the name, platform, and a picture or YouTube video detailing the app, along with any links to iTunes/Google Play/etc. where the app can be purchased. MUSIC PRODUCTION APP for iPhoneDeveloped in partnership with Retronyms — www.retronyms.comTurn your iPhone into an MPC. With more than 1,200 samples, 50 editable programs, 80 editable sequences, and iconic MPC workflow, iMPC is the first app to bring the look and feel of the classic Akai Pro MPC to your iPhone. iMPC includes everything you need to create a beat quickly and easily, including built-in effects, plus the ability to create new sequences and record and overdub beats. Time correction from 1/8 note to 1/32T with variable swing, and Note Repeat from 1/8 note to 1/32T with latch control are also built in. The app’s built-in sampler can record samples three different ways: using the mic on the iPhone, using the line input on the iPhone, or using the multi-touch turntable interface in iMPC to record samples directly from iTunes or other music libraries. Exciting "3D Perform" controls -- use your iPhone's motion sensors to control parameters! M/S Processor is an Audiobus-compatible iOS application intended for audio professionals requiring Mid/Side (M/S) signal processing. While the most common use case for M/S Processor is decoding a Mid/Side signal into two components (Left and Right), the reverse process (encoding) is also possible. A third mode, Inline mode, is also included. In this mode, a stereo signal is encoded into Mid and Side components, and finally decoded into stereo again. This 2-in-1 mode is useful for tasks such as narrowing or widening the stereo image, or muting the Mid or Side channels independently for creative or experimental purposes. M/S Processor is most useful when used as an Audiobus filter. In this case, M/S Processor can be used to process audio before feeding it into any other Audiobus-compatible audio application such as Apple's Garageband for recording and further processing. You get over 3 hours of 1080p video, and the man knows his stuff. 2013 marks our 15th anniversary! AAS was indeed founded in 1998 and, looking back, we are very proud of our family of instruments and most grateful to our customers and partners who made all this possible. To celebrate this milestone, we are happy to offer you a 50% discount on Lounge Lizard EP-4, Chromaphone, and Ultra Analog VA-1. We have also cooked up a bundle of these three unique instruments at an unbeatable price. An important synth from early in the VSTi/DXi age--still useful and intelligently designed. Edited by iococoi, 04 August 2013 - 06:55 AM. Studio quality reverb for Audiobus and your iTunes music library. The creation of high quality reverb needs a realistic simulation of the important early reflections together with a smooth and colorless reverberation tail. The early reflections are the most important clue for the human ear to get a feeling about the dimension and character of a room. Most algorithmic reverbs offer a number of different algorithms to simulate different natural rooms like chamber, halls or artificial ones like plates. AudioReverb uses impulse responses from real acoustic spaces and classical reverb algorithms to emulate their acoustical properties. The resulting reverberation sets new standards in clarity and sense of space ! Use AudioReverb for enhancing your listening experience with your favourite iTunes songs. Use AudioReverb as professional reverb plugin to improve the quality of any Audiobus compatible App. Reverberate any song in your iTunes library. Quiztones is a frequency ear training app for amateur and professional audio engineers, producers, and musicians. Quiztones uses tones and frequency-altered noise and musical loops (including source material from your own music library) to train your ears and help develop more acute listening and frequency recognition skills. New in 1.7: Train your ears to identify boost & cut between 1-16dB with our new Gain Level Comparison quizzes! These new quizzes are available via the Quiztones Pro in-app purchase. "Turns out, this app offers everything offered in that Berklee class of mine… in an app!" The Quiztones app is far and away the best app I've purchased. It's an incredible tool for all audio engineers and musicians ... My mixing has improved by leaps and bounds after just a few weeks with Quiztones. "As a professional audio engineer my most prized tool is my ears. Developing this acute sense of understanding can take years of development. With Quiztones, both aspiring and professional engineers alike can now develop and sharpen the skill(s) of 'truly musical hearing' while on-the-go. Quiztones is both fun and educational, merging the two into an addictive and beneficial mobile app." A professional Audio Engineer of 10 years, I've come across many ear training devices, blind tests, and software. This app is TOPS! Highly recommended! The developers are serious about what they do. You will not be disappointed! Best support is on devices with dual core CPUs: iPad 2, iPad 3 and iPhone 4S, on older devices it is restricted and not as good. Sketch Synth FX lets you draw effects onto your sounds, layer by layer using it's XY pads. 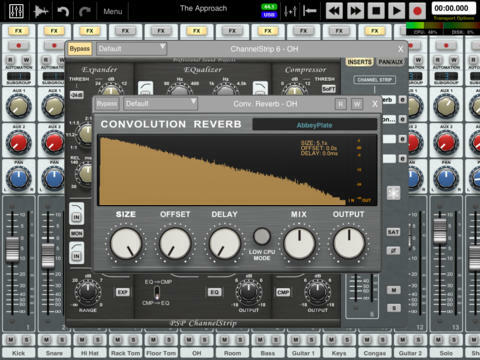 Simply work from the sample input at the left, through the effects channels and to the output at the right. You always work on samples/recordings, Sketch Synth FX messes around with your samples, what it is not is a guitar amp (although you can record your guitar with it, I recommend using a separate record with input level monitoring and then using Audio Copy and Paste to copy the sample across). You can record and export using Audio Copy & Paste (Sonoma not intua yet) or iTunes File Sharing. The effects you can apply include: delay, distortion, low/high pass filter, pitch, chorus. The effects can come on pretty strong and so you have a bypass control that really helps smooth chaotic effects into nicer evolving sounds. This version comes with 3 themes / sample packs, including one sample pack from DJ Vadim. Best support is on devices with dual core CPUs: iPad 2, iPad 3 and iPhone 4S. On older devices you will notice that measures have been taken to restrict recording length and lack of cpu can mean layering multiple effects together can cause audio clicks and crackles, also recording takes time to save as well. I wanted initially to take it off the app store for these single core devices; but it is not possible now it is up, so I will being working to bring a whole new load of low cpu effects instead. Sketch Synth FX also comes with Sketch Synth 3D and Sketch Sound 3D now, so if you have one of those then make sure you get the latest updates and you'll get this automatically (albeit with fewer samples). Ah so is this 'apps' as in the mobile phone use of the word (e.g. something for Android/iOS) rather than just any music application ? No, any apps - a good example is your video mention above. I just happen to have featured only iOS stuff so far. Kraftpad is a Virtual Analog Drum Synthesizer which is capable of creating your own electronic drum sounds by offering 10 different kinds of dedicated synthesizers to easily create each drum sound. A highly tweakable stereo delay audio effect, suitable for everything from clean digital delays to filthy dub echoes and broken cassette tapes. Tape simulation (noise and warble). Filters in the delay loop for typical dub sound. Stereo delay, stereo detune, ping-pong delay. Built-in lookahead limiter to prevent clipping. We have also partnered with the Bob Moog Foundation so that a portion of each sale goes to support their work in music education via the Dr. Bob Sound school program, making available the archives of Dr. Bob Moog and funding the dream to build the Moogseum. The Minimoog™ synthesizer was made famous by artists and bands such as Stevie Wonder, Depeche Mode, Kraftwerk, Keith Emerson, Devo, Jean Michel Jarre and more. We now bring the features and sound of this classic to the iOS platform. But this is not all; iMini is ‘Tabletop Ready’. 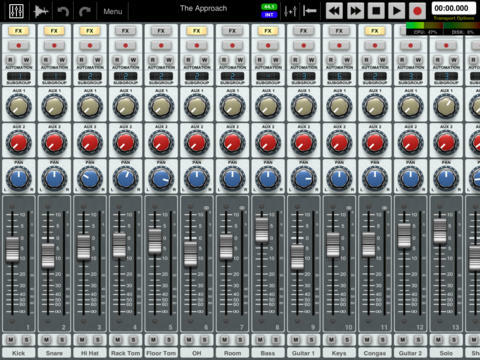 Tabletop is a free iPad application that allows you to integrate iMini into a full studio of devices. With Tabletop you can build an entire song, with drum machines, FX's, sequencers... and of course the inimitable Minimoog™ sound. The Minimoog™ name used here is a trademark of the respective owners, which are in no way associated or affiliated with Arturia. These trademarks are used solely to identify the products whose sound and features were modeled during the development process. Vintage Electro–Theremin, Onassis Martino style synth. This app is inspired by early classic slider controlled synthesisers such as the Ondes-Martenot, Trautonium and Tannerin/electro-theremin. – Ideal for professionals looking for an alternative to the keyboard controlled synth. – Great for anyone interested in synthesizers, particularly early analogue. In 1928 Maurice Martenot created one of the first electronic musical instruments, entitled; the Ondes-Martenot, the prerunner to the theremin, similar in sound but with a very different type of user interaction, an inspiring slider on a cord was used. Later in the 1950s Paul Tanner invented the Tannerin a.k.a. Electro Theremin. The Tannerin used the same slider controls as the Ondes-Martenot to control pitch. The Tannerin went on to play a large role in records such as The Beach Boys “Good Vibrations”. Auria - the 48-track digital audio recording system for iPad. The mobile DAW you've been dreaming of has arrived. Auria is a 48-track digital recording system designed from the ground up for the iPad. With professional-level features like AAF import/export, and optional third-party plugin support from names like PSPaudioware, Overloud, Fab Filter and Drumagog, Auria clearly sets a new standard for mobile recording. It is my app of choice. The beat kits are pretty phenomenal. I started mainly using the 808 and 909, but there are other kits that are great. The instruments presets are not stellar but I am able to make them sound it through the amazing instrument unit itself. It is as complex as the simpler. There is also support for audio which I use often. It has probably my favorite Compressor and Bitcrusher of all time. I used Beatmaker 1 extensively, and it was much more limited, but got some good results because it was one of the first apps that allowed sampling with the iphone's internal mic. I do all of my primary sampling with that very mic. Having an MPC in your pocket is an amazing thing. Here is one I did almost exclusively on Beatmaker 2, using a synth sample from animoog. All of the sequencing and beats were done in BeatMaker2. I posted this here before. BeatMaker 2: the most advanced mobile music workstation. Did I mention how visually pleasing it is? Definitely the prettiest fully featured DAW on iOS. I think this one is pretty funny. Edited by logakght, 26 December 2013 - 02:56 PM. Tapatalk App Free For Android Phones - Today Only! Get it free while it lasts!